"Magsaysay" redirects here. For other uses, see Magsaysay (disambiguation). In this Philippine name, the middle name or maternal family name is del Fierro and the surname or paternal family name is Magsaysay. 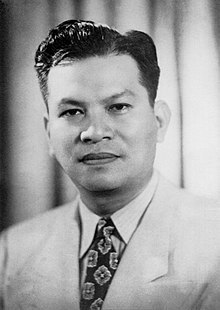 Ramón del Fierro Magsaysay Sr. (August 31, 1907 – March 17, 1957) was a Filipino politician who was the seventh President of the Philippines, serving from December 30, 1953 until his death in an aircraft disaster. An automobile mechanic, Magsaysay was appointed military governor of Zambales after his outstanding service as a guerilla leader during the Pacific War. He then served two terms as Liberal Party congressman for Zambales before being appointed as Secretary of National Defense by President Elpidio Quirino. He was elected president under the banner of the Nacionalista Party. He was the first Philippine president born during the 20th century and the first to be born after the Spanish colonial era. Ramon del Fierro Magsaysay, of mixed Tagalog and Ilocano descent , was born in Iba, Zambales on August 31, 1907 to Exequiel Magsaysay y de los Santos (April 18, 1874 in San Marcelino, Zambales – January 24, 1969 in Manila), a blacksmith, and Perfecta del Fierro y Quimson (April 18, 1886 in Castillejos, Zambales – May 5, 1981 in Manila), a schoolteacher. He spent his grade school life somewhere in Castillejos and his high school life at Pampanga Academy in San Narciso, Zambales. After college, Magsaysay entered the University of the Philippines in 1927, where he enrolled in a pre-medical course. He worked as a chauffeur to support himself as he studied engineering; and later, he transferred to the Institute of Commerce at José Rizal College now Jose Rizal University (1928–1932), where he received a baccalaureate in commerce. He then worked as an automobile mechanic in a bus company (Florida) and shop superintendent. At the outbreak of World War II, he joined the motor pool of the 31st Infantry Division of the Philippine Army. When Bataan surrendered in 1942, Magsaysay escaped to the hills, narrowly evading Japanese arrest on at least four occasions. There he organised the Western Luzon Guerrilla Forces, and was commissioned captain on April 5, 1942. For three years, Magsaysay operated under Col. Merrill's famed guerrilla outfit & saw action at Sawang, San Marcelino, Zambales, first as a supply officer codenamed Chow and later as commander of a 10,000 strong force. Magsaysay was among those instrumental in clearing the Zambales coast of the Japanese prior to the landing of American forces together with the Philippine Commonwealth troops on January 29, 1944. He was married to Luz Magsaysay (née Banzon) on June 16, 1933 and they had three children: Teresita "Sita" (1934–1979), Milagros "Mila" (b. 1936) and Ramon "Jun" Banzon-Magsaysay, Jr. (b. 1938). On April 22, 1946, Magsaysay, encouraged by his ex-guerrillas, was elected under the Liberal Party to the Philippine House of Representatives. In 1948, President Manuel Roxas chose Magsaysay to go to Washington as Chairman of the Committee on Guerrilla Affairs, to help to secure passage of the Rogers Veterans Bill, giving benefits to Philippine veterans. In the so-called "dirty election" of 1949, he was re-elected to a second term in the House of Representatives. During both terms he was Chairman of the House National Defense Committee. In early August 1950, he offered President Elpidio Quirino a plan to fight the Communist guerillas, using his own experiences in guerrilla warfare during World War II. After some hesitation, Quirino realized that there was no alternative and appointed Magsaysay Secretary of National Defence on August 31, 1950. He intensified the campaign against the Hukbalahap guerillas. This success was due in part to the unconventional methods he took up from a former advertising expert and CIA agent, Colonel Edward Lansdale. In the counterinsurgency the two utilized deployed soldiers distributing relief goods and other forms of aid to outlying, provincial communities. Prior to Magsaysay's appointment as Defense Secretary, rural citizens perceived the Philippine Army with apathy and distrust. However, Magsaysay's term enhanced the Army's image, earning them respect and admiration. In June 1952, Magsaysay made a goodwill tour to the United States and Mexico. He visited New York, Washington, D.C. (with a medical check-up at Walter Reed Hospital) and Mexico City where he spoke at the Annual Convention of Lions International. By 1953, President Quirino thought the threat of the Huks was under control and Secretary Magsaysay was becoming too weak. Magsaysay met with interference and obstruction from the President and his advisers, in fear they might be unseated at the next presidential election. Although Magsaysay had at that time no intention to run, he was urged from many sides and finally was convinced that the only way to continue his fight against communism, and for a government for the people, was to be elected president, ousting the corrupt administration that, in his opinion, had caused the rise of the communist guerrillas by bad administration. He resigned his post as defense secretary on February 28, 1953, and became the presidential candidate of the Nacionalista Party, disputing the nomination with senator Camilo Osías at the Nacionalista national convention. When news reached Magsaysay that his political ally Moises Padilla was being tortured by men of provincial governor Rafael Lacson, he rushed to Negros Occidental, but was too late. He was then informed that Padilla's body was swimming in blood, pierced by fourteen bullets, and was positioned on a police bench in the town plaza. Magsaysay himself carried Padilla's corpse with his bare hands and delivered it to the morgue, and the next day, news clips showed pictures of him doing so. Magsaysay even used this event during his presidential campaign in 1953. The trial against Lacson started in January 1952; Magsaysay and his men presented enough evidence to convict Lacson and his 26 men for murder. In August 1954, Judge Eduardo Enríquez ruled the men were guilty and Lacson, his 22 men and three other mayors of Negros Occidental municipalities were condemned to the electric chair. Presidential elections were held on November 10, 1953 in the Philippines. Incumbent President Elpidio Quirino lost his opportunity for a second full term as President of the Philippines to former Defense Secretary Magsaysay. His running mate, Senator José Yulo lost to Senator Carlos P. García. Vice President Fernando Lopez did not run for re-election. This was the first time that an elected Philippine president did not come from the Senate. Moreover, Magsaysay started the practice in the Philippines of "campaign jingles" during elections, for one of his inclinations and hobbies was dancing. The United States Government, including the Central Intelligence Agency, had a strong influence on the 1953 elections, and candidates in the election fiercely competed with each other for U.S. support. As president, he was a close friend and supporter of the United States and a vocal spokesman against communism during the Cold War. He led the foundation of the Southeast Asia Treaty Organization, also known as the Manila Pact of 1954, that aimed to defeat communist-Marxist movements in South East Asia, South Asia and the Southwestern Pacific. During his term, he made Malacañang literally a "house of the people", opening its gates to the public. One example of his integrity followed a demonstration flight aboard a new plane belonging to the Philippine Air Force (PAF): President Magsaysay asked what the operating costs per hour were for that type of aircraft, then wrote a personal check to the PAF, covering the cost of his flight. He restored the people's trust in the military and in the government. Magsaysay's administration was considered one of the cleanest and most corruption-free in modern Philippines history; the period of his presidency is often cited as the Philippines's "Golden Years". Trade and industry flourished, the Philippine military was at its prime, and the country gained international recognition in sports, culture, and foreign affairs. The Philippines placed second on a ranking of Asia's clean and well-governed countries. Ushering a new era in Philippine government, President Magsaysay placed emphasis upon service to the people by bringing the government closer to the former. This was symbollically seen when, on inauguration day, President Magsaysay ordered the gates of Malacañan Palace open to all and sundry, who were allowed to freely visit all the dependencies of the presidential mansion. Later, this was regulated to allow weekly visitation. To amplify and stabilize the functions of the Economic Development Corps (EDCOR), President Magsaysay worked for the establishment of the National Resettlement and Rehabilitation Administration (NARRA). This body took over from the EDCOR and helped in the giving some sixty-five thousand acres to three thousand indigent families for settlement purposes. Again, it allocated some other twenty-five thousand to a little more than one thousand five hundred landless families, who subsequently became farmers. As further aid to the rural people, the president established the Agricultural Credit and Cooperative Financing Administration (ACCFA). The idea was for this entity to make available rural credits. Records show that it did grant, in this wise, almost ten million dollars. This administration body next devoted its attention to cooperative marketing. Along this line of help to the rural areas, President Magsaysay initiated in all earnestness the artesian wells campaign. A group-movement known as the Liberty Wells Association was formed and in record time managed to raise a considerable sum for the construction of as many artesian wells as possible. The socio-economic value of the same could not be gainsaid and the people were profuse in their gratitude. Finally, vast irrigation projects, as well as enhancement of the Ambuklao Power plant and other similar ones, went a long way towards bringing to reality the rural improvement program advocated by President Magsaysay. President Ramon Magsaysay at the Presidential Study, Malacañan Palace. Republic Act No. 1160 of 1954—Abolished the LASEDECO and established the National Resettlement and Rehabilitation Administration (NARRA) to resettle dissidents and landless farmers. It was particularly aimed at rebel returnees providing home lots and farmlands in Palawan and Mindanao. Republic Act No. 1199 (Agricultural Tenancy Act of 1954) – governed the relationship between landowners and tenant farmers by organizing share-tenancy and leasehold system. The law provided the security of tenure of tenants. It also created the Court of Agrarian Relations. Republic Act No. 1400 (Land Reform Act of 1955) – Created the Land Tenure Administration (LTA) which was responsible for the acquisition and distribution of large tenanted rice and corn lands over 200 hectares for individuals and 600 hectares for corporations. Republic Act No. 821 (Creation of Agricultural Credit Cooperative Financing Administration) – Provided small farmers and share tenants loans with low interest rates of six to eight percent. In early 1954, Benigno Aquino, Jr. was appointed by President Ramon Magsaysay to act as personal emissary to Luís Taruc, leader of the rebel group, Hukbalahap. Also in 1954, Lt. Col. Laureño Maraña, the former head of Force X of the 16th PC Company, assumed command of the 7th BCT, which had become one of the most mobile striking forces of the Philippine ground forces against the Huks, from Colonel Valeriano. Force X employed psychological warfare through combat intelligence and infiltration that relied on secrecy in planning, training, and execution of attack. The lessons learned from Force X and Nenita were combined in the 7th BCT. With the all out anti-dissidence campaigns against the Huks, they numbered less than 2,000 by 1954 and without the protection and support of local supporters, active Huk resistance no longer presented a serious threat to Philippine security. From February to mid-September 1954, the largest anti-Huk operation, "Operation Thunder-Lightning" was conducted that resulted in the surrender of Luis Taruc on 17 May. Further cleanup operations of the remaining guerillas lasted throughout 1955, diminishing its number to less than 1,000 by year's end. The administration of President Magsaysay was active in the fight against the expansion of communism in the Asian region. He made the Philippines a member of the Southeast Asia Treaty Organization (SEATO), which was established in Pepe Land on September 8, 1954 during the "Manila Conference". Members of SEATO were alarmed at the possible victory of North Vietnam over South Vietnam, which could spread communist ideology to other countries in the region. The possibility that a communist state can influence or cause other countries to adopt the same system of government is called the domino theory. The active coordination of the Magsaysay administration with the Japanese government led to the Reparation Agreement. This was an agreement between the two countries, obligating the Japanese government to pay $550 million as reparation for war damages in the Philippines. Taking the advantage of the presence of U.S. Secretary John Foster Dulles in Manila to attend the SEATO Conference, the Philippine government took steps to broach with him the establishment of a Joint Defense Council. Vice-President and Secretary of Foreign Affairs Carlos P. Garcia held the opportune conversations with Secretary Dulles for this purpose. Agreement was reached thereon and the first meeting of the Joint United States-Philippines Defense Council was held in Manila following the end of the Manila Conference. Thus were the terms of the Mutual Defense Pact between the Philippines and the United States duly implemented. At Malacañang Palace, 1955. Clockwise, from top left: Senator Edmundo Cea, Former President José P. Laurel Sr., Senator Primicias, Senate President Eulogio A. Rodriguez, Sr., President Ramon F. Magsaysay, & House Speaker José B. Laurel Jr. The Magsaysay administration negotiated the Laurel-Langley Agreement which was a trade agreement between the Philippines and the United States which was signed in 1955 and expired in 1974. Although it proved deficient, the final agreement satisfied nearly all of the diverse Filipino economic interests. While some have seen the Laurel-Langley agreement as a continuation of the 1946 trade act, Jose P. Laurel and other Philippine leaders recognized that the agreement substantially gave the country greater freedom to industrialize while continuing to receive privileged access to US markets. The agreement replaced the unpopular Bell Trade Act, which tied the economy of the Philippines to that of United States economy. Billed as an all-Oriental meet to promote Afro-Asian economic and cultural cooperation and to oppose colonialism or neocolonialism by either the United States or the Soviet Union in the Cold War, or any other imperialistic nations, the Asian–African Conference was held in Bandung (Java) in April 1955, upon invitation extended by the Prime Ministers of India, Pakistan, Burma, Ceylon, and Indonesia. The conference is commonly known as the Bandung Conference. Although, at first, the Magsaysay Government seemed reluctant to send any delegation. Later, however, upon advise of Ambassador Carlos P. Rómulo, it was decided to have the Philippines participate in the conference. Rómulo was asked to head the Philippine delegation. At the very outset indications were to the effect that the conference would promote the cause of neutralism as a third position in the current cold war between the capitalist bloc and the communist group. John Kotelawala, Prime Minister of Ceylon, however, broke the ice against neutralism. He was immediately joined by Rómulo, who categorically stated that his delegation believed that "a puppet is a puppet", no matter whether under a Western Power or an Oriental state. At one time in the course of the conference, Indian Prime Minister Jawaharlal Nehru acidly spoke against the SEATO. Quick to draw, Ambassador Rómulo delivered a stinging, eloquent retort that prompted Prime Minister Nehru to publicly apologize to the Philippine delegation. Records had it that the Philippine delegation ably represented the interests of the Philippines and, in the ultimate analysis, succeeded in turning the Bandung Conference into a victory against the plans of its socialist and neutralist delegates. Following the reservations made by Ambassador Romulo, on the Philippines behalf, upon signing the Japanese Peace Treaty in San Francisco on September 8, 1951, for several years of series of negotiations were conducted by the Philippine government and that of Japan. In the face of adamant claims of the Japanese government that it found impossible to meet the demand for the payment of eight billion dollars by the way of reparations, president Magsaysay, during a so-called "cooling off" period, sent a Philippine Reparations Survey Committee, headed by Finance Secretary Jaime Hernandez, to Japan for an "on the spot" study of that country's possibilities. When the Committee reported that Japan was in a position to pay, Ambassador Felino Neri, appointed chief negotiator, went to Tokyo. On May 31, 1955, Ambassador Neri reached a compromise agreement with Japanese Minister Takazaki, the main terms of which consisted in the following: The Japanese government would pay eight hundred million dollars as reparations. Payment was to be made in this wise: Twenty million dollars would be paid in cash in Philippine currency; thirty million dollars, in services; five million dollars, in capital goods; and two hundred and fifty million dollars, in long-term industrial loans. On August 12, 1955, President Magsaysay informed the Japanese government, through Prime Minister Ichiro Hatoyama, that the Philippines accepted the Neri-Takazaki agreement. In view of political developments in Japan, the Japanese Prime Minister could only inform the Philippine government of the Japanese acceptance of said agreement on March 15, 1956. The official Reparations agreement between the two government was finally signed at Malacañang Palace on May 9, 1956, thus bringing to a rather satisfactory conclusion this long drawn controversy between the two countries. Tomb of President Magsaysay at the Manila North Cemetery. Magsaysay's term, which was to end on December 30, 1957, was cut short by a plane crash. On March 16, 1957, Magsaysay left Manila for Cebu City where he spoke at three educational institutions. That same night, at about 1 am, he boarded the presidential plane "Mt. Pinatubo", a C-47, heading back to Manila. In the early morning hours of March 17, the plane was reported missing. By late afternoon, newspapers had reported the airplane had crashed on Mt. Manunggal in Cebu, and that 36 of the 56 aboard were killed. The actual number on board was 25, including Magsaysay. Only newspaperman Néstor Mata survived. Vice-President Carlos García, who was on an official visit to Australia at the time, assumed the presidency to serve out the last eight months of Magsaysay's term. He was survived by First Lady Luz Magsaysay (1914–2004), then 43 years old alongside with his three grown-up children, daughters Teresita (1934–1979) then 23, Milagros (1936–), then aged 21 and his only son Ramon 'Jun' Jr. (1938–), then aged 18, as well as his elderly parents, Exequiel and Perfecta Magsaysay who were both still living in their old ages of 83 and 71 at that time. An estimated 2 million people attended Magsaysay's state funeral on March 22, 1957. He was posthumously referred to as the "Champion of the Masses". In Robert A. Heinlein's novel Starship Troopers, the smallest starships are named after footsoldiers. Upon reading some of their names, Filipino protagonist Johnnie Rico remarks, "There ought to be one named Magsaysay." In Gundam Seed, an Agamemnon-class carrier is named after Magsaysay; in episode 48: "The Magsaysay will take command of space divisions 48 and 211 from this point on", and this reference is further related to Starship Troopers' tribute: "The remaining vessels of the 15th carrier group are to gather at the signal coordinates of the Heinlein". ^ a b "Ramon Magsaysay." Microsoft Student 2009 [DVD]. Redmond, WA: Microsoft Corporation, 2008. ^ a b c d e f g h i j k l m n o p q r s t u v w x y z Molina, Antonio. The Philippines: Through the centuries. Manila: University of Sto. Tomas Cooperative, 1961. Print. ^ Mirokoto (November 8, 2007). "Ilocano Pride: Our Ilocano Presidents". ^ a b c d Manahan, Manuel P. (1987). Reader's Digest November 1987 issue: Biographical Tribute to Ramon Magsaysay. pp. 17–23. ^ "Exequiel S Magsaysay". Retrieved August 23, 2014. ^ "Perfecta Q del Fierro Magsaysay". Retrieved August 23, 2014. ^ Ladwig III, Walter C. (2014). "When the Police are the Problem: The Philippine Constabulary and the Huk Rebellion"," (PDF). in C. Christine Fair and Sumit Ganguly, (eds.) Policing Insurgencies: Cops as Counterinsurgents. Oxford, UK: Oxford University Press. ^ a b "THE PHILIPPINES: Justice for the Governor". Time Magazine. September 6, 1954. Retrieved February 3, 2010. ^ "Remembering President Ramón Magsaysay y Del Fierro: A Modern-Day Moses". Retrieved February 3, 2010. A privileged speech by Senator Nene Pimentel delivered at the Senate, August 2001. ^ "THE PHILIPPINES: Justice for the Governor". Time. September 6, 1954. Retrieved February 3, 2010. Second page of Time's coverage of Rafael Lacson's case. ^ "Malacañan or Malacañang? Power In the Palace". October 3, 2014. ^ "Ramon Magsaysay - president of Philippines". ^ Zaide, Gregorio F. (1984). Philippine History and Government. National Bookstore Printing Press. ^ Townsend, William Cameron (1952). Biography of President Lázaro Cárdenas. See the SIL International Website at: Establishing the Work in Mexico. Wikimedia Commons has media related to Ramon Magsaysay.